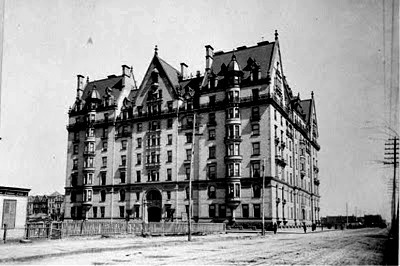 The Dakota took just over 4 years to build and was finally finished in October of 1884, it was also designed by the same architectural firm who designed the famous Plaza hotel. It was named the Dakota because at the time of construction it was placed in such a sparsely built up area of Manhattan that it seemed as remote as the territory of Dakota itself. Something hard to imagine today since the building stands right next to towering apartment buildings and is surrounded by city blocks. Since the building was one of the first of its size in the area and also had a number of unique design features, it was recognised by the state as being a New York city Landmark in 1969. It was also added to the National register of historic places in 1972 and was designated a national historic landmark in 1976. But the Dakota was made most famous a few years later in 1980 when its most memorable incident took place, which was the murder of the former Beatle's star John Lennon. On the evening of December 8th, 1980, Mark David Chapman shot Lennon in the entryway to the building off of 72nd street as he was returning home from a session at the recording studio. Its thought he did not die straight away but instead on route to the nearby Roosevelt hospital as he was pronounced dead upon arrival. The strawberry field memorial was placed in Central Park in his memory. Today the building holds private residential apartments and are generally valued between $4 million and $30 million each. Lennons widow, Yoko Ono still owns several apartments there to this day. As for visiting this place I would imagine it would hold the same rules as any other apartment block in the city, which means you would need permission from either the owner of the the section of the building you would wish to visit or permission from the governing body of the complex. As you can probably guess the most famous ghost here is thought to be of John Lennon himself, but he is far from the first supernatural being to inhabit the building. He himself even claimed to have seen a UFO from the window of his apartment, and also claimed to have seen the apparition of a woman walking down one of the corridors which he nicknamed "the crying lady ghost". Also another of the building famous residents, Maury Povich who is the host of a popular talk show described the building as being "very haunted". Even though Lennon is the most famous ghost here he is certainly not the most commonly seen, and reports of the building being haunted started as early as 30 years before his death. The most commonly sighted ghost here seems to be of a young girl who has been described as having long blonde hair and always wearing a dress. She seemed to appear most often during the 1960's when many of the workers who were renovating the building claimed to see her in the corridors, often bouncing a ball as she skipped along. She is thought to be a friendly ghost and has been known to smile at anyone who makes eye contact with here. There is also the story of a woman who saw her in the lobby and watched her walk across the room and go through another door on the other side. Something about the child peaked the woman's curiosity and she went over to the door to see were the child went, only to find out the door led to an empty closet. The most haunted area of the building has to be the basement, were poltergeist activity seems to take place on an almost regular basis. Heavy objects have been moved around here on their own and people have even claimed to have had objects thrown towards them. People have also claimed to have seen an apparition of a man here, with him being described by a number of people as being a short, long nosed man with a beard and wire framed glasses wearing a frockcoat and high hat. The strangest ghost in the building has to be that of a man who has been described as having the height and body of a man in his 20's, but with the face of a small child. He has been seen many times over the last few decades throughout the whole building, even inside peoples apartments, but who he is seems to remain forever unknown.